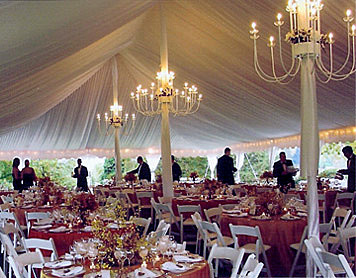 You can rely on L & A Tent Rentals, Inc. to help you produce a tented event that is memorable and stress-free. A family-owned and family-operated business, we have served the Washington DC area for over 30 years. Our event professionals can help party planners, event coordinators, caterers, meeting planners, and individuals planning a personal event with every detail of event planning. We offer free site visits and pride ourselves on solving even the most difficult outdoor party challenges. Our multi-million dollar inventory of tents and event equipment ensures that we can meet all your event needs and budget requirements. Whether you’re planning a backyard party for a few friends or a corporate meeting for hundreds of attendees, we have the inventory and the experience to make your event a success. Here are just a few of the services and products that L & A Tent Rentals, Inc. offers. Our experienced event planners are happy to work with you from event concept to the day of your event, ensuring a memorable event that is flawlessly produced. ©2009 L&A Tent Rentals, Inc.